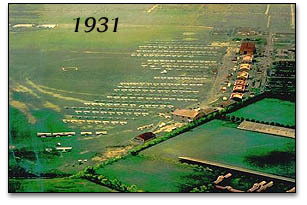 Mitchel Field continued to grow after World War I and be tween 1929 and 1932 a major new construction program was undertaken. New brick barracks, officers clubs, housing, warehouses, and operations buildings were constructed, as well as eight massive steel and concrete hangars. Much of this construction remains in place today. Between the wars Mitchel was the Armies premier air corps base, somewhat of a military Country Club atmosphere with fine housing, clubs, pools, polo fields and tree-lined streets. It became home to several observation, fighter and bombardment groups and it hosted the 1920 and 1925 National Air Races. The 1920 Pulitzer Race saw Major C. S. Mosely set a new speed record of 156 mph, while in 1925 Lt. Cyrus Bettis set another world speed record of 249 mph in a Long Island built Curtiss Racer. In 1922, the Army laid out its first air route, a model airway, from Mitchel field to McCook Field, Ohio. In 1938, Mitchel was the starting point for the first nonstop transcontinental bomber flight, made by Army B-18s. 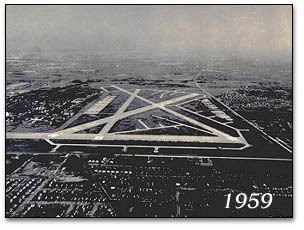 Mitchel Field also served as a base from which the first demonstration of long-range aerial reconnaissance was made. In May 1939, three B-17s led by Lt. Curtiss Lemay flew 750 miles out to sea and intercepted the Italian ocean liner Rex. This was a striking example of the range, mobility and accuracy of modern aviation at the time. During World War II, Mitchel was the main point of air defense for New York City, equipped with two squadrons of P-40 fighters. In the late 1940s it was headquarters of the Air Defense Command, First Air Force and Continental Air Command. By 1949, Mitchel was relieved of the responsibility for defending New York City because of the many problems associated with operating tactical aircraft in an urban area. However, Mitchel did serve as the terminus for the last speed record set on Long Island, a transcontinental speed record of 4 hours, 8 minutes set by Col. W. Millikan in an F-86 on January 2, 1954. After several notable crashes, including a P-47 into Hofstra Universities Barnard Hall, public pressure ultimately led to the fields closure. The last active unit to be based at Mitchel was the 514th Troop Carrier Wing flying Fairchild C-119 Flying Boxcars. Due to the noise, small size of the field, and several spectacular crashes, Mitchel was closed in 1961 with the property being turned over to the County of Nassau.